When it comes to permitting any piece of equipment in the SCAQMD — not just coffee roasters — Rule 219 plays a large role in the process. Unfortunately, it’s also the permitting rule that causes the most confusion. So let me try to break it all down for you. By the time you finish this article, Rule 219 won’t seem like the Big Bad Wolf most make it out to be. 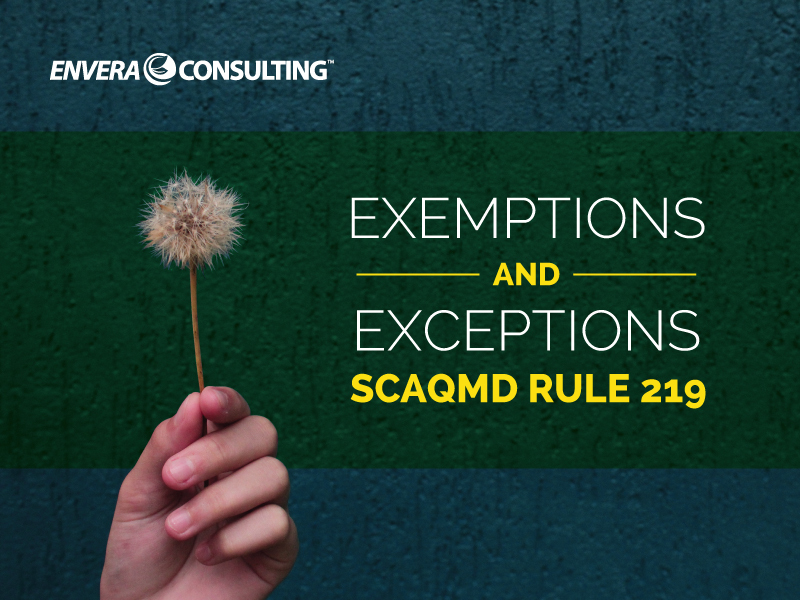 SCAQMD Rule 219 is a list of equipment that is exempt from needing an air permit. Considering all the various contaminant-emitting machinery out there (just take a look at the 405), it might seem like a tall order for the 700-employee agency to permit all of those pollutant-spewing machines. That’s where Rule 219’s exemptions come in. First off, the SCAQMD is only responsible for stationary sources such as emergency engines, not vehicles such as cars and ships. That’s one reason that Rule 219 includes mobile sources at the top of its exemption list. In these sources, the sizes or design of the equipment desired in the Rule is assumed to be a de minimum level of emissions and, thus, a permit is not needed. Although the Rule 219 specifications seem to be very specific (i.e., 10 lbs. or less of coffee), some parts of the rule are, well, a tad vague. For example, in Rule 219 (x), a wastewater plant can be exempt if there are no VOC (volatile organic compounds) emissions from the source. Not one bit of VOC can be emitted. Zip. Zero. Nada. For a wastewater plant, that’s pretty rare. That same rule section exempts equipment used in the R&D process if it is not related to production and the size is below bench scale. The problem here is that the term “bench scale” is not defined in the rule and its usage in different industries varies quite a bit. Heck, I’ve seen the term used differently within a single industry. This is where things can really get confusing. We now know that Rule 219 lists exemptions to permitting. Then within the same rule, there are exceptions to those exemptions. So before you get all giddy that your equipment is exempt from permitting, take a gander at the criteria in section (s) of Rule 219. The most common exception can be found in section (s)(1), which states that a permit is required from an otherwise exempt piece of equipment if the health risk from the equipment exceeds a given threshold. For example, a manually operated blast cabinet with an internal volume of 1.5 m3 or less and that is vented to a filter appears to be a part of the exemption list, per Rule 219 (f)(2). However, when you get to section (s)(1), you find that if the cabinet is blasting metal parts with a high nickel content (which would cause the health risk to exceed the limits in Rule 1401), this cabinet is not an exception to the exemption. In other words, it needs a permit. If you’re one of the lucky ducks who finds your equipment is exempt, what do you do next? Rule 219 (t) spells that out for you: You’re required to maintain documentation that the piece of equipment under analysis was found to be exempt. Having this documentation helps in case an inspector questions the permit applicability of the equipment when visiting your operation. And if the applicability was previously done, then it’s good to show them that the analysis was complete. A note of caution: Just like any other rule, Rule 219 is subject to change due to rulemaking amendments. So not only should you keep this documentation on hand, but you should also be regularly reviewing Rule 219 to ensure that equipment that is exempt stays exempt.